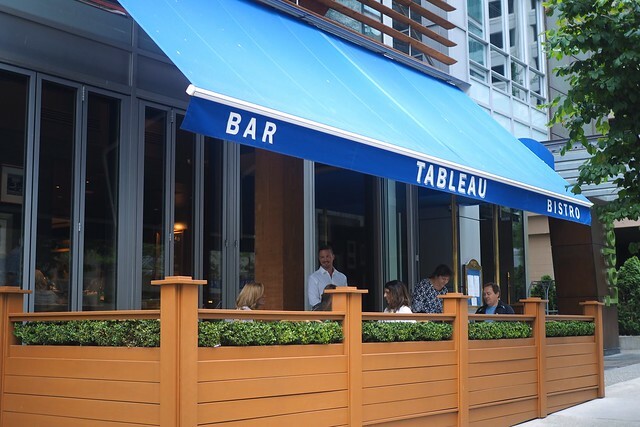 Coal Harbour—(July 11, 2015) Tableau Bar Bistro's fine French cuisine extends to their brunch service from Executive Chef Marc-André Choquette inside the boutique Loden Hotel. 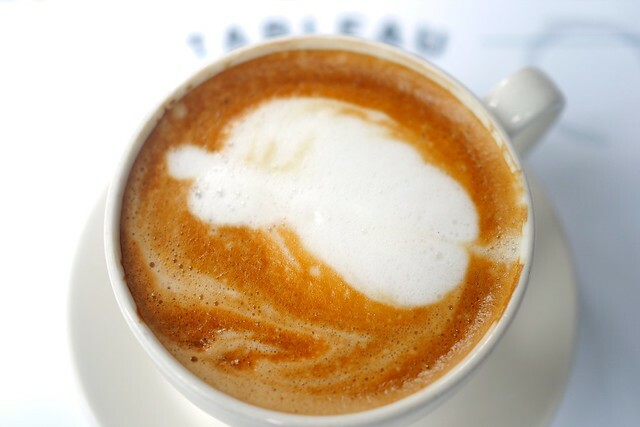 Last week, Tableau held a tasting to showcase their weekend offerings on their outdoor patio on a misty summer morning. Sipping on the 1181 cocktail (with gin, elderflower, lemonade, and sparkling wine) upped the classical feel of our surroundings and general French inspiration in the air. Full of citrus and gin flavours, it's a refreshingly tart libation. 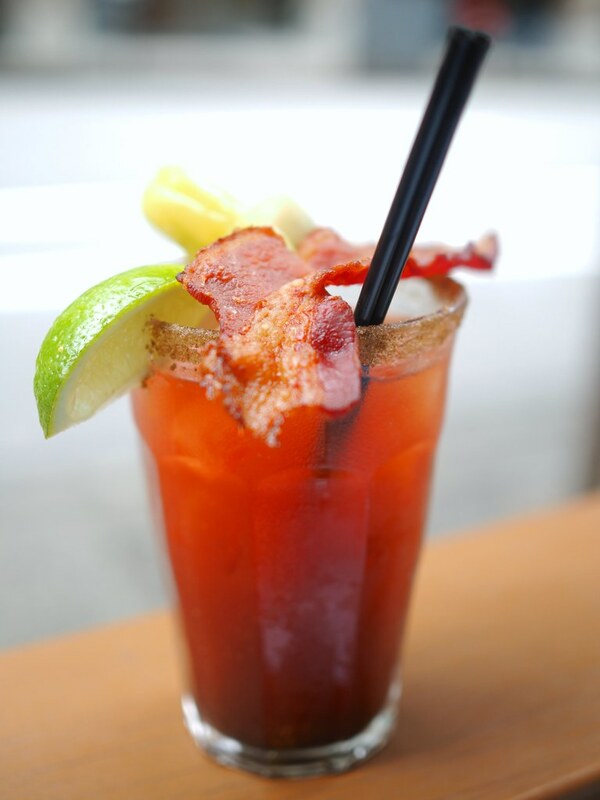 This bacon Caesar (with house made bacon infused vodka and Clamato juice) did not disappoint with an unmistakable yet mild bacon flavour throughout. I'm far from a Caesar or Bloody Mary fan, but this was more than easy drinking with a pleasingly subtle richness to it. 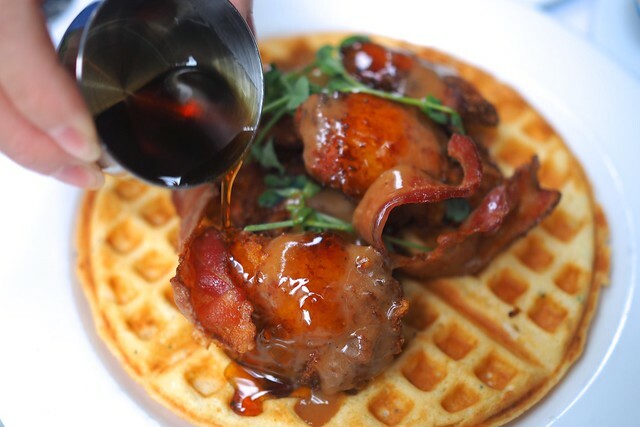 I, of course, had to try the buttermilk fried chicken and waffles (with maple syrup and chicken gravy) and despite being rather basic looking, I found it very appetizing. 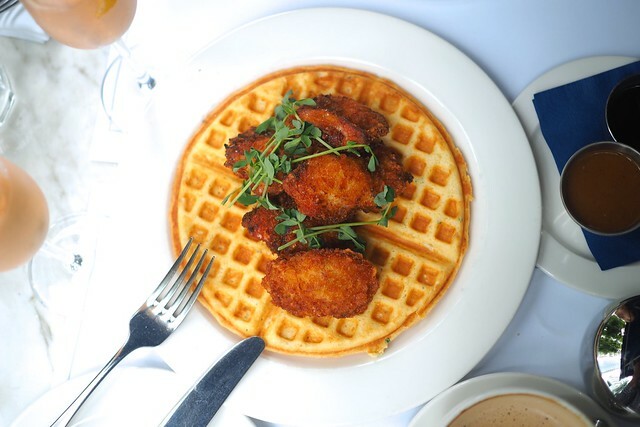 The flat, thin, and perfectly circular waffle made it easy to wrap the boneless, breaded white chicken pieces coated in syrup and gravy. While still substantial, this was a lighter take on the ubiquitous Southern dish. 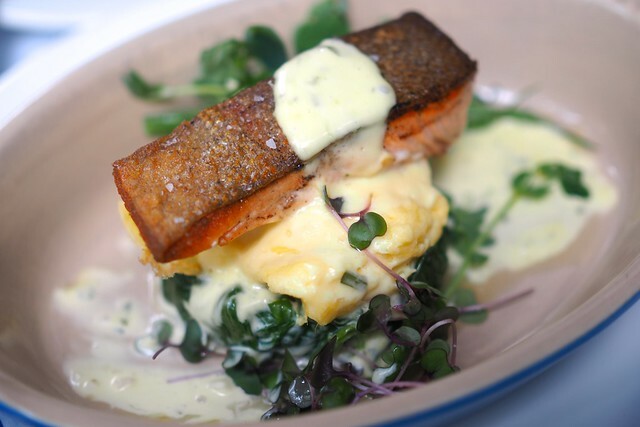 The steelhead trout (with scrambled eggs, spinach, and béarnaise sauce) came recommended despite seeming initially unremarkable. I did indeed find it a rather satisfying fish dish full of creamy flavours suitable for our mid-morning meal. I also quite enjoyed my café au lait (with steamed milk) for its crisp yet frothy texture. It was a nice treat over brunch. For dessert, the chocolate mouse (served in a sundae glass) was a darkly sweet treat with hints of hazelnut and the lemon tart was bursting with flavour in its general robust, fruity tanginess. 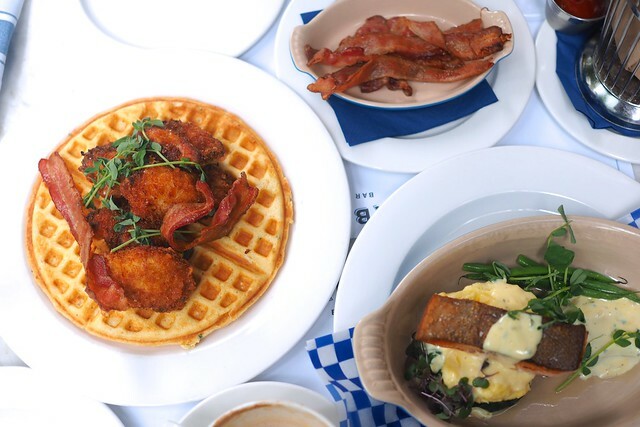 Overall, Tableau's detailed yet comforting selection of brunch items are fairly complementary and more enjoyable on the whole (sharing is recommended) rather than over each individual dish. I suggest ordering a side to fill out your meal (we ordered bacon and frites). 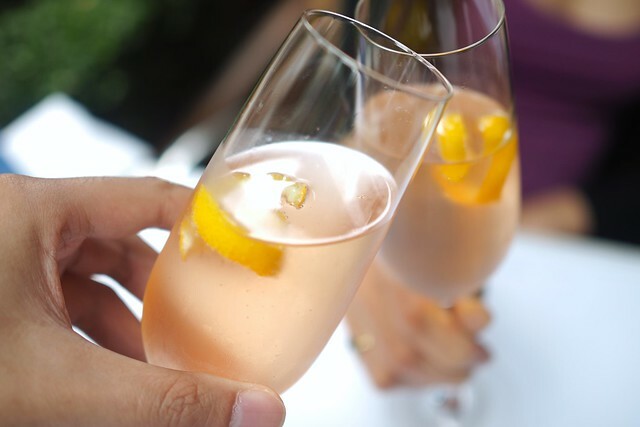 From the cocktails, éntrees, and sides, everything mostly fits together well in Tableau's unassuming yet satisfying French style brunch menu. It makes for a fancy feeling meal.